On Saturday, while I was clearing the weeded area where we saw a largish toad last week, a smaller, rather dirt-encrusted toad suddenly appeared and took small hops away from where I had been digging. I understand they bury themselves in the soil to regulate their temperature. This one took shelter nearby in the shade of some tall grass next to a bag of composted manure. Chives are in full flower now, and I love them for their reliable gift of color to the early garden each year. Here's a decent look at about half the length of the garden bed. The area on the right - the whole north side of the long, east/west-oriented bed - was filled with daylilies and other perennials as well as a lot of tall grass until the past couple of weeks, when we moved most of that out to make more room for edibles. My digging muscles got a good workout. Now I've got nine tomato plants in the ground and some squash seeds planted along that side. It will be great to have so much room to work with. In the foreground, above, are cilantro (just planted and not quite perked up yet), a pepper plant, sage (a perennial) and parsley. Beyond that is basil, lettuce and kale. Behind the viewer, from this photo's perspective, will be zucchini and cucumbers. Here's a close-up of one of the strong, sturdy tomato plants from Big Woods Farm that I bought at Just Food Co-op's plant sale three weeks ago. This one is a new variety to me: Tasty Evergreen, which is supposed to produce large fruits that stay green when ripe. I kept the plants under a grow-light indoors until recently, since it has been so cool. Tomatoes like warmth, and of course they really go wild when we got those hot and humid mid-summer days. Until then, the growth should be steady but sedate. I can't wait until it's time to start picking. Today was the first time I've made it to the Northfield farmers' market this season. Lots and lots of bedding plants were on hand, from tomatoes to cabbage to pak choi to herbs and flowers. We bought some marigolds for our vegetable garden to add color and help deter unwanted insects, and some lemon thyme, cilantro, and two kinds of basil: Thai and purple (red). Spinach and mixed salad greens appeared to be the main produce available, and these should be picking up in the weeks ahead until the weather turns consistently hot. Baked goods (including a gluten-free assortment), eggs, honey, and maple syrup were also on hand, and we bought a quart bottle of the syrup as well as some delicious cinnamon rolls. At one table you could get freshly made crepes! The adjacent playground makes this a fun and manageable outing for young families and adds to the atmosphere for other browsers. Finally, in a parking lot. It finally happened. Not in the woods, not in my backyard, not by the river, not at a field, but on a driveway and the adjacent parking lot (okay, the driveway and the parking lot were in Big Woods State Park, near the visitor's center, but still...), on Sunday, I finally saw two quite common but utterly beautiful birds for the first time in my life, within five minutes of each other. They were a male rose-breasted grosbeak and a male Baltimore oriole. I didn't get any photos, and I'm not going to go on about it, but twice in five minutes I was quietly ecstatic. And so my resident bird expert will attest. While digging out some perennials in our large garden bed this evening, we suddenly noticed this amphibian sitting very still in an unweeded area just a few feet away. I didn't want to get too close and scare it away, but this shot gives a fairly good idea. It was around three inches long. Despite the dark spots it was certainly not noticeably warty, and my first impression was "frog." But as I look at images of the frogs and toads listed on the Minnesota DNR website, I don't see it looking very like any of the frogs - but not strongly like any of the toads, either. The pale line right down the spine is suggestive of the American toad, but the outline of our little guy seems much smoother than that. I would in general more easily expect to find a toad than a frog in a garden, but the backyard neighbors have a swimming pool and we quite often hear what we believe are frog sounds from that direction in the summers. We didn't see ours hop away, didn't get a look at the feet, and didn't hear it make any sounds. So, any experts out there? This is not the typical view of Northfield, Minnesota, which would make most people who have been here think of college architecture, a historic main street dating to the second half of the 19th century, and pleasantly varied houses on tree-lined streets where in many cases there are no longer any above-ground utility lines. I find the little touch of urbanism above interesting and rather endearing: the telephone or power lines; the unadorned flat faces of the rear apartments; the absence of green; the little hint of Europe (somehow I imagine Marseilles) in the balcony with the yellow backdrop. This is the view not meant to be seen. Stepping back and swinging the camera a few degrees to the left, this is the public counterpart to the same location: the graceful mature tree (I'm guessing an elm, by its shape, but perhaps a cottonwood) framing the stately post office whose parking lot opens the way to the view seen above; the old-fashioned street lamps; the hint of the public square beyond. See more Skywatch photos from around the world here. Click on the photos to see much more detail. We took the day off today to seek out migratory songbirds in the eastern reaches of the Cannon River Wilderness Area. 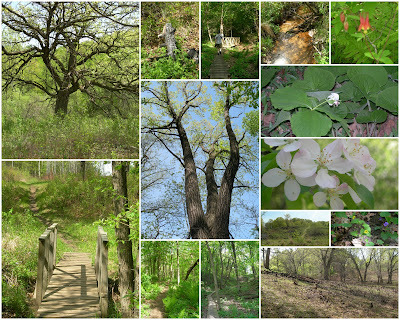 Wildflowers were in evidence everywhere, and the trees were alive with the calls and songs of birds we could usually see only for a second or two at a time, if at all, as they flitted among the newly leafy (and luckily some not yet so leafy) branches. We soon realized that American redstarts were all around us. This strikingly colored member of the warbler family is a darkish gray with bright orange patches on the wings and tail. They live in Minnesota year-round. As we walked through dappled woodland, we either heard or caught quick glimpses of indigo bunting, catbird, blue jay, Nashville warbler, yellow warbler, yellow-rumped warbler, house wren, common yellowthroat, and eastern wood-peewee. Several of these are just migrating through our area on their way to breeding grounds farther north. The trail leads eventually to a savannah area open to the sky. This is a favorite area of mine, which at the top of the rise has a wide but secluded view and is a great place to watch turkey vultures and hawks ride the thermals over the surrounding hills. We were surprised to find evidence that quite an extensive area had been burned since our last visit. Mature trees did not seem to have been much damaged, but the low growth had clearly been burned out and was experiencing regeneration. Up in this more open environment, we saw American goldfinches, brownheaded cowbirds, wood thrush, hermit thrush, a couple of ruby-throated hummingbirds, turkey vultures. and another unidentified soaring raptor. These pink-tinted blossoms covered a small tree along the path. I think it is a kind of crab apple, but it might be a member of the plum family. After a lunch break and some downtime, we headed over to the Upper Arb at Carleton to see what else we could see. Things were relatively quiet; we were there before the birds got active for their late-afternoon feeding time. The highlight of that visit was a giant oak delightfully populated with quite a flock of cedar waxwings. 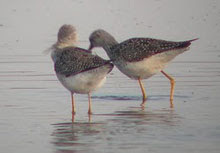 While I had one in view through the binoculars, another approached it and a moment later they appeared to be kissing. My resident bird expert tells me that this is food presentation by the male to the female, part of the courtship ritual that presumably demonstrates his willingness and ability to provide. Anyway, it was a charming moment and I felt lucky to have had the chance to see it. We also saw several jewel-like tree swallows, their irridescent wings shining metallic blue in the sunlight, on or near nesting boxes that have been built in some of the young restored savannah areas, and finally we saw the other resident of those boxes we had been watching for: an eastern bluebird, our first of the season. The bluebird is a member of the thrush family; together with the two thrushes we had seen at the CRWA, a Swainson's thrush seen on our neighbor's lawn this morning, and the ever-present American robin, that made it a five-thrush day. After we'd been back home for an hour or so, we were amused to discover an even larger congregation of the gorgeous cedar waxwings in two large just-leafing-out trees adjacent to our house. The photo above is one of the best I was able to get, since the birds don't stay still long. Click on the Skywatch badge to see other sky photos from around the world. Spring is really here: white-throated sparrows have been heard, the grass needs mowing, the rhubarb is growing nicely (I have a nice, deeply red variety, as you can see in the photo), and fresh local asparagus from Lorence's Berry Farm is now available at the co-op -- and, one assumes, at Lorence's! Had an exalted dinner tonight of salmon and asparagus. Heaven! The canine and feline members of the household thought so too when they received tidbits of the salmon skin. For more musings on oh-so-welcome spring foods, you might possibly want to pop over to my recent post, and others, on the Eat Local Just Food blog, where the pleasures of rhubarb, asparagus, and strawberry shortcake are discussed at greater length. Not that we have local strawberries quite yet, but it won't be too long now. About a year and a half ago I wrote about Michael Perry's book Truck: A Love Story and quoted a passage I found particularly intimate and moving. That post can be found here. Perry will be at the Northfield Arts Guild this evening at 7:30 to read from his new book, Coop: A Year of Poultry, Pigs and Parenting. His visit is sponsored by Monkey See Monkey Read bookstore. I'll be racing back from a choir potluck to attend, and will most certainly be buying a copy of the book. Coop picks up where Truck ends; I can't wait to read it. Here is Mike talking about the new book. I was admiring this budding tulip recently, and thought I'd take a photo of it daily until it opened fully. The photo above wasn't properly focused, but you can see it was going to be a lovely color. The next day, sad to say, all three tulips in this small bed near our front door had been beheaded, leaving only stray petals as evidence that they were ever there. I assume that our neighborhood rabbits are responsible. After a day in the 80s a week ago followed by several rainy days this week, trees and shrubs have started greening up in earnest. Yesterday's gray skies cast subtle light on a copse of trees east of the hospital. The rising ground at the left suggests an intriguing reversal of the earth's curvature. Penelopedia is about birdwatching and other encounters with nature in southern Minnesota, supporting an ethic of awareness, respect, and stewardship. Bluebird Report May 22 - First Eggs! Does Beetle Leaf Damage Affect Linden Floral Nectar? Breads from Brick Oven Bakery in Northfield - sooooo good! Tortilla chips from Whole Grain Milling Co.
(C) Penelopedia 2007-2015. Simple theme. Theme images by gaffera. Powered by Blogger.